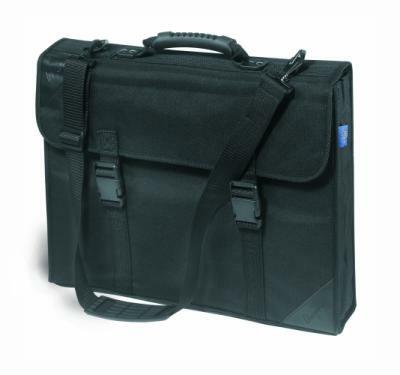 Made from heavy duty shower proof nylon with reinforcements for protection. 70mm side gusset, Velcro tabs, shoulder strap. Ideal for carrying artwork. Available in 2 sizes which can hold either A3 or A2 artwork. This is a real Zinger!! I have had an A3 portfolio for some time, and it never comfortably holds A3 pads and pencils and pastels and oil pastels and a packet or two of crisps without the paper crumpling or the zip groaning for a slimming diet. This Mapac case is a great improvement. It appears strongly made of nylon cloth, and looks well-finished. It easily accommodates A3 pads with 3cm width and 6 cm height to spare. The depth front-to-back is 7 cm. There are strong card side-supports which fit into gussets in each side, and a rubber bottom panel to stop water and worms creeping up. There are TWO! zipped internal full-sized front and back panels to take loose A3 papers, but an A3 pad with cardboard back won't fit in without straining the zip. Pity the zip isn't a bit longer. Put in a couple of pads and there is loads of room for several boxes of pencils, pastels, oil crayons, and at least a couple of bags of crisps. The shoulder strap is wide and comfortable, and the price is silly!